Paranormal crime stories by bestselling fiction writers like Kelley Armstrong, Anne Perry, Simon R. Green, Patricia Briggs, and more. A massive, monumental volume of paranormal crime fiction by bestselling authors. Gripping tales of mayhem include both novellas and short stories like Stalked by,” by Kelley Armstrong, The Judgment” by worldwide bestselling author Anne Perry, Appetite for Murder” by Simon R. Green, , Road Dogs” by Norman Partridge, The Hex Is In” by Mike Resnick, Doppelgangster” by Laura Resnick, the chilling If Vanity Doesn’t Kill Me” by Michael A. Stackpole, and many, many, more. Compiled and edited by the world’s most prolific anthologistthe award-winning Martin H. Greenbergthis is the biggest paranormal crime book on the market and the ultimate collection for crime lovers, ghost hunters, and thrill seekers everywhere. Also included are multiple stories by New York Times bestselling authors. 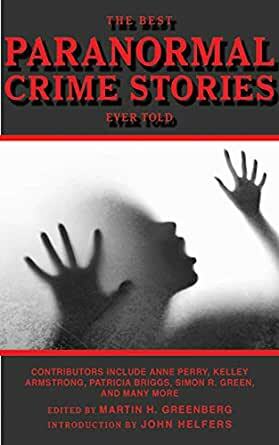 The Best Paranormal Crime Stories Ever Told is a new book in the series, which includes The Best Hunting Stories Ever Told and The Best Fishing Stories Ever Told. Martin H. Greenberg has been called “the best anthologist since Ellery Queen.” He’s the most prolific anthologist in publishing history and recipient of the Ellery Queen Award for life achievement in editing from the Mystery Guild of America. He is also one of the editors of Vampire Stories by Sir Arthur Conan Doyle. He lives in Green Bay, Wisconsin. I gave this book 3 stars because I agree with previous reviewers that the quality of the stories is uneven. Some I'd definitely have given 4 stars and some only 2. Perhaps we are not correctly identifying the issue here, however. Perhaps it is just that readers obviously have different tastes and respond best to stories that reflect their preferences. So, without intending to denigrate the work of any of the writers included in the collection, I'm going to be very specific about some of my likes and my dislikes. "The Judgement" by Anne Perry--This one or Rusch's work was definitely my favorite in the book. "The Night of Their Lives" by Max Allans Collins--It seemed to me that the whole point of the story was merely to arrive at the final sentence, and that just wasn't enough for me. "Ninja Rats on Harleys" by Elizabeth A Vaughan--This story annoyed me more than any other in the book. Why? Because there was so much to like about it. I loved the writing, the cast of characters, and the premise. Having established this much, however, the author just stopped. There was no real story here (no there...there). It read like the first chapter of a novel--a novel I might well have enjoyed quite a bit. As is, however, the story more than disappointed. 5.0 out of 5 starsHIghly recommend! So glad I purchased this book! Seriously, I enjoyed every single story in this collection and that's just not the norm. Lately, any anthology I've purchased I've only enjoyed maybe half of the stories and in past collections there were usually only one or two that weren't to my taste. I know I'll reread this collection again and again because I love to revisit great writing! And I have a LOT of new authors to check out. Something that I really appreciated about this anthology is that even when it was obvious that the story was situated in a world the author had created, I didn't feel lost in that world or as if I was missing anything - there was plenty of context for someone who hadn't read whatever series it might have originated from. This was a terrific read! It is a collection of short stories by authors that write paranormal fiction. I have read other works by some of these authors and was delighted to find that they write short stories as terrific as their longer works. The stories are suspenseful, engaging, and will leave you wanting more. I recommend this to anyone who reads paranormal books. The first story is great, the others are good, but lack the "something" that différenciante a "short story" from a regular story cut short. They feel more like excerpts from longer works. Still, a good way to get to know several authors and their worlds. I don't give a five star very often, but I cam close here. Rating systems like this frustrate me since the best leader i ever had routinely gave us 3 ratings. When I pushed the reply was: "i expect you to perform at the highest professional level. When you do that you meet my expectations. That level of performance may exceed the expectations of others. Do you want to work for someone who has lower standards? I expect the best and you give it. What's the problem?" I started this book with very high expectations. These authors met those expectations. I ended each story thinking that I have to read more by this author.